I think I desperately want to be a sock knitter, but something about it terrifies me. Maybe it's the things that people have said about turning a heel being a right of passage, or maybe it's just that it requires working with teeny tiny double pointed needles and super thin thread. So for my first sock, I'm going to try the Monkey Socks by the queen of awesome socks, Cookie A., which might sound overambitious, but I don't think there are any new stitch techniques to learn and the lace pattern doesn't look any more complicated than stuff I've done before. My other problem revolves around maybe not having enough yarn. 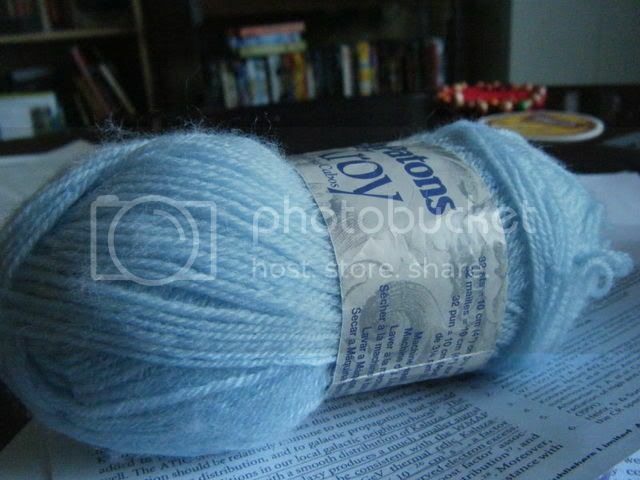 I found some really nice powder blue Patons Kroy 3 Ply (no link because Google seems to think that the Patons site has malware) in my grandmother's stash. There's one skein of 262 yards per 50g, but the Monkey pattern requires 360 yards. It seems silly for me to start something new when I have three projects in the works right now, but I just have so much inspiration! (Cue corny romantic music.) I'm currently working on a baby blanket (using up that fuzzy green yarn, yay!) for my colleague whose fiance is having a baby, the stupid frickin' candy apple shrug (should I just rip it out at this point? ), and the circles rug from the Crochet Me book. I should probably slow down and get some real work done... Oh, speaking of which, I just made a breakthrough in my research which will save me days of work, so I'm in pretty high spirits. I wish I'd figured it out weeks ago, but, alas, such is the nature of research.